Ligand-bound estrogen receptor α (ERα) and estrogen receptor β (ERβ) modulate AP-1-dependent transcription via protein-protein interactions on DNA, in a manner that depends on the type of cells and the subtype of ER. We present here evidence for an additional mechanism by which ERs modulate the transcriptional activity of AP-1. We show that ERs located in the cytoplasm efficiently activate transcription at AP-1 sites in response to 17β-estradiol, while ERs present in the nucleus repress transcription under the same conditions. 17β-estradiol-induced activation of the coll-73-luc reporter correlated with cytoplasmic localization of various ERα and ERβ mutant receptors, and was inhibited in the presence of the full estrogen antagonist ICI 182,780 and the MAP-kinase inhibitor UO126. We also show that the selective estrogen receptor modulator (SERM) tamoxifen is as potent as 17β-estradiol in inducing activation of AP-1 when ERα is present in the cytoplasm. These results suggest that non-genomic signalling is involved in the mechanism by which ERα and ERβ influence AP-1-dependent transcription. We have previously shown that Stat3 and Stat5 are targeted by non-genomic actions of ERs, and the results presented here allow us to conclude that ERs bound to 17β-estradiol mediate the transcriptional activation of promoters regulated by AP-1 and by Stat proteins via different combinations of signal transduction pathways. Our observations thereby provide new insights into the mechanisms by which ERs act at alternate response elements, and suggest a mechanism by which tamoxifen exerts its action as a tissue-selective agonist. Estrogen is a key regulator of growth, differentiation and function in a broad range of target tissues, including the male and female reproductive tracts, mammary gland, bone, brain and the cardiovascular system. The biological effects of estrogen are mediated through estrogen receptor α (ERα) and estrogen receptor β (ERβ), which belong to a large superfamily of nuclear receptors that act as ligand-activated transcription factors. These receptors share a well-conserved DNA-binding domain (DBD) and a structurally conserved ligand-binding domain (LBD). The N-terminal domains of these receptors, on the other hand, do not resemble each other [1, 2]. The classical mechanism of activation of ERs depends on ligand binding to the receptors, after which the receptors dimerize and bind to estrogen response elements (EREs) located in the promoters of estrogen-responsive genes . Ligand binding also induces a conformational change within the LBD of the receptors, and this conformational change allows co-activator proteins to be recruited . ERs may also regulate gene expression in the absence of DNA-binding by modulating the activities of other transcription factors via protein-protein interactions on DNA. This mechanism is referred to as cross-talk and is common for several nuclear receptors . For example, ligand-bound ERs upregulate and downregulate transcription from genes that contain AP-1 sites, binding sites for the Jun/Fos complex, in a manner that depends on the type of cells and the subtype of ER [6–9]. Furthermore, ERα and ERβ efficiently potentiate the transcriptional activity of signal transducer and activator of transcription (Stat) 5 b when Stat5b is bound to the β-casein promoter following prolactin stimulation . In addition, specific amino acids within the ER DBD are important for transcriptional cross-talk on promoters regulated by AP-1 and by Stat5b . The rapid effects of estrogen observed in the mammary gland, bone, brain and the cardiovascular system suggest that estrogen also exerts non-genomic effects, possibly via membrane-associated ERs that are linked to signal transduction proteins . For example, estrogen rapidly activates the MAP-kinase, Src-kinase, and PI3-kinase signalling pathways [13–16]. We have previously shown that 17β-estradiol-bound ERα and ERβ efficiently induce transactivation of promoters regulated by Stat proteins via signal transduction pathways . In this study, we present evidence that also AP-1 is a downstream target of non-genomic actions of ERs. We show that ERα and ERβ located in the cytoplasm efficiently induce transcriptional activation of the AP-1-regulated collagenase promoter in response to 17β-estradiol, while ERs present in the nucleus repress promoter activity under the same conditions. We also show that the cellular localization of the respective receptor subtypes determines the response to selective estrogen receptor modulators (SERMs) at AP-1 sites, and we suggest that this contributes to the tissue-specific actions of SERMs observed in vivo. Finally, we conclude that the combinations of signal transduction pathways required for 17β-estradiol-induced activation of AP-1 is different from that required for activation of Stat proteins. We have previously shown that ERs located in the cytoplasm efficiently induce transactivation of Stat-regulated promoters via non-genomic signalling . We have used an ERα variant with disturbed localization (NLSA) (Fig. 1A and ) to analyse whether the cellular localization of ER affected transcription from the AP-1-regulated collagenase promoter. Fig. 1B shows that the coll-73-luc reporter  was induced 3-fold in response to 17β-estradiol upon co-transfection with NLSA into HC11 mouse mammary epithelial cells, while the wild-type receptor repressed the reporter 2-fold under the same conditions. These results encouraged us to analyse whether ERβ displayed a similar activity on the collagenase promoter when ERβ is present in the cytoplasm. We therefore chose to use an N-terminal deletion mutant of ERβ (ERβ 148-530 Flag) that we knew was predominantly present in the cytoplasm of cells (Fig. 1A). It is not known why ERβ 148-530 Flag remains located in the cytoplasm. Interestingly, however, a corresponding deletion mutant comprising a Flag tag upstream of the N-terminus (ERβ Flag 148-530) showed nuclear staining (Fig. 1A). 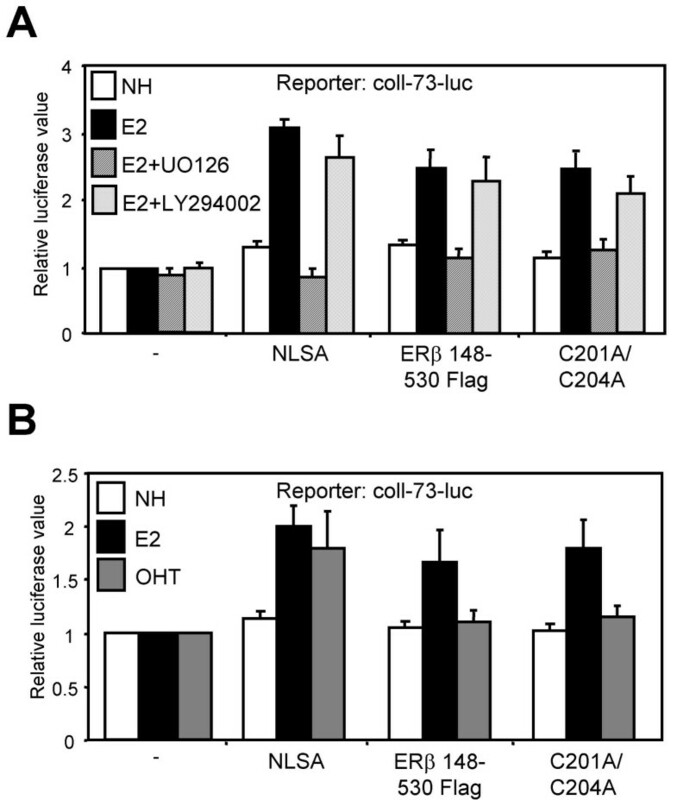 We found that the cytoplasmic ERβ 148-530 Flag variant activated the coll-73-luc reporter 2.5-fold in response to 17β-estradiol, while ERβ Flag 148-530 located in the nucleus acted like the wild-type receptor and repressed the reporter 2-fold under the same conditions (Fig. 1B). These results show a perfect correlation between the cellular localization of the receptor and its activity on the collagenase promoter. Cytoplasmic variants of ERα and ERβ display reversed activity at an AP-1 response element. (A) HC11 cells were transfected with expression vectors for ERα wt, NLSA, deleted in the hinge domain (Δ245-307), ERβ wt, ERβ Flag 148-530 or ERβ 148-530 Flag. The cellular localization of the receptor proteins was analysed by indirect immunofluorescence as described in Experimental Procedures. HC11 cells were transiently co-transfected with (B) 500 ng coll-73-luc reporter gene or (C) 1 μg β-casein reporter gene and 200 ng of ERα wt, NLSA, ERβ wt, ERβ Flag 148-530 or ERβ 148-530 Flag. Cells were treated with either no hormone (NH) or 10-8 M 17β-estradiol (E2), and the reporter activity was analysed 24 hours after treatment. Luciferase activity was normalised using β-gal as an internal control. Data are representative of at least three independent experiments performed in duplicate. Mean and ± SD are shown. NLSA induces transactivation of the Stat-regulated β-casein promoter via non-genomic signalling . Fig. 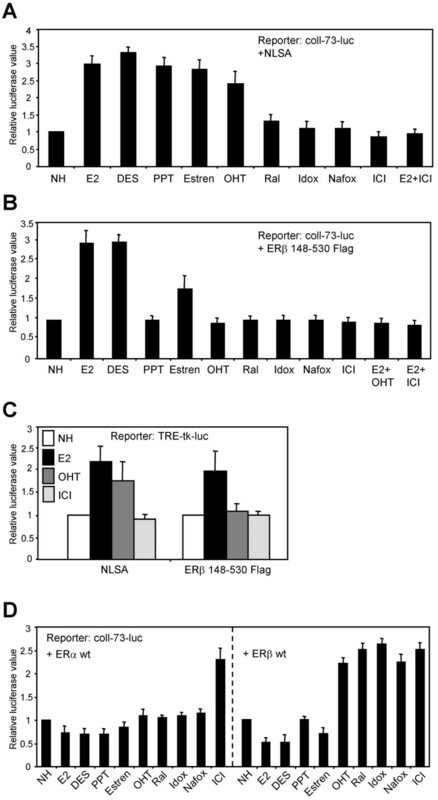 1C shows that the β-casein reporter  was induced 5-fold and 6-fold, respectively, in response to 17β-estradiol upon co-transfection with NLSA or ERβ 148-530 Flag into HC11 cells, while ER wild type receptors and ERβ Flag 148-530 only showed weak responses on the reporter. These results strongly suggest that ERβ 148-530 Flag, like NLSA, acts on the promoter via non-genomic signalling. In summary, cytoplasmic localization of ERα and ERβ correlates with a reversed response by 17β-estradiol on the collagenase promoter, suggesting that AP-1 can be induced to activate transcription via non-genomic actions of ERs, in a manner similar to that of Stat proteins. We recently showed that the introduction of various point mutations into the ERβ DBD results in an altered response by ER ligands on the collagenase promoter . Fig. 2A shows that the coll-73-luc reporter was induced 3-fold in response to 17β-estradiol upon co-transfection with an ERβ mutant comprising a disruption of the second zinc binding motif (C201A/C204A) into HC11 cells, while the wild-type receptor repressed the reporter 2-fold under the same conditions. Fig. 2A also shows that the Stat-regulated β-casein reporter was induced 2.5-fold in response to 17β-estradiol upon co-transfection with C201A/C204A. We have previously shown that C201A/C204A is unable to potentiate the transcriptional activity of prolactin-activated Stat5b through cross-talk in the nucleus . Thus, the response by 17β-estradiol indicates that the mutant receptor induces transactivation of the β-casein promoter through a distinct mechanism, independently of pre-activated Stat proteins. ERβ structurally disrupted in the DBD re-localizes to the cytoplasm and induces AP-1 activity in the presence of 17β-estradiol. (A) HC11 cells were transiently co-transfected with 500 ng coll-73-luc reporter gene or 1 μg β-casein reporter gene and 200 ng of ERβ wt or C201A/C204A. Cells were treated with either no hormone (NH) or 10-8 M 17β-estradiol (E2), as indicated, and the reporter activity was analysed 24 hours after treatment. Luciferase activity was normalised using β-gal as an internal control. Data are representative of at least three independent experiments performed in duplicate. Mean and ± SD are shown. (B) HC11 cells were transfected with expression vectors for ERβ wt or C201A/C204A. Cells were treated with either no hormone (NH) or 10-8 M 17β-estradiol (E2), as indicated, and the cellular localization of the receptor proteins was analysed 24 hours after treatment by indirect immunofluorescence as described in Experimental Procedures. The similarity between the results shown in Fig. 2A and the results shown in Fig. 1 prompted us to analyse the cellular localization of C201A/C204A. We found that the mutant receptor re-localized to the cytoplasm of cells upon treatment with 17β-estradiol, while the localization of the wild-type receptor, as expected, was not affected (Fig. 2B). We also noted that all of the previously described ERβ DBD mutants that displayed an altered response by ER ligands on the collagenase promoter  re-localized to the cytoplasm upon treatment with 17β-estradiol and, furthermore, induced transcription from the β-casein promoter more efficiently than the wild-type receptor (data not shown). In summary, the introduction of various point mutations into the ERβ DBD results in an altered localization of the receptor in the presence of 17β-estradiol. The cytoplasmic localization correlates perfectly with efficient transactivation of promoters regulated by AP-1 and by Stat proteins, and this strongly suggests that non-genomic signalling is involved. We analysed the ability of ER to modulate AP-1-dependent transcription via non-genomic signalling in the presence of various ER ligands. Fig. 3A shows that the coll-73-luc reporter was induced 3-fold in response to the natural agonist 17β-estradiol, the non-steroidal agonist diethylstilbestrol (DES), the ERα selective agonist propyl pyrazole triol (PPT)  and the synthetic compound 4-estren-3a,17β-diol (estren) upon co-transfection with NLSA into HC11 cells. Interestingly, while the selective estrogen receptor modulator (SERM) tamoxifen induced transcription 2.5-fold, the SERMs raloxifene, nafoxiden and idoxifen showed no effect on the promoter. The full estrogen antagonist ICI 182,780 was unable to induce transcription and, furthermore, completely inhibited the 17β-estradiol-induced response on the coll-73-luc reporter. Ligand-dependent ER actions at an AP-1 response element. HC11 cells were transiently co-transfected with 500 ng coll-73-luc reporter gene and (A) 200 ng of NLSA or (B) ERβ 148-530 Flag. Cells were treated with either no hormone (NH), 10-8 M 17β-estradiol (E2), 10-7 M DES, 10-7 M PPT, 10-7 M estren, 10-7 M tamoxifen (OHT), 10-7 M raloxifene (Ral), 10-7 M idoxifene (Idox), 10-7 M nafoxidene (Nafox) or 10-7 M ICI 182,780 (ICI), as indicated, and the reporter activity was analysed 24 hours after treatment. Luciferase activity was normalised using β-gal as an internal control. Data are representative of at least three independent experiments performed in duplicate. Mean and ± SD are shown. (C) HC11 cells were transiently co-transfected with 500 ng TRE-tk-luc reporter gene and 200 ng of NLSA or ERβ 148-530 Flag. Cells were treated with either no hormone (NH), 10-8 M 17β-estradiol (E2), 10-7 M tamoxifen (OHT) or 10-7 M ICI 182,780 (ICI), as indicated, and further assayed as described in A and B. (D) HC11 cells were transiently co-transfected with 500 ng coll-73-luc reporter and 200 ng of ERα wt or ERβ wt. Cells were treated and analysed as described in A and B. The activity of ERβ 148-530 Flag on the coll-73-luc reporter in the presence of the various ER ligands is shown in Fig. 3B. The reporter was induced 3-fold in response to 17β-estradiol and DES, while the ERα selective ligand PPT showed no affect, and estren induced the reporter 2-fold. ERβ 148-530 Flag did not activate transcription in the presence of any of the SERMs, tamoxifen, raloxifene, nafoxiden or idoxifen, or the full estrogen antagonist ICI 182,780 and, furthermore, the 17β-estradiol-induced response on the reporter was completely inhibited in the presence of tamoxifen and the presence of ICI 182,780. Notably, C201A/C204A showed responses on the coll-73-luc reporter in the presence of the various ER ligands tested that are similar to those of ERβ 148-530 Flag (data not shown). A consensus reporter construct including two AP-1 binding sites (TRE-tk-luc) was co-transfected together with NLSA or ERβ 148-530 Flag into HC11 cells in order to confirm that the ER-dependent activation of the authentic coll-73-luc reporter is mediated through the AP-1-binding site in the collagenase promoter. Fig. 3C shows that similar results were obtained using the TRE-tk-luc reporter as were obtained with the coll-73-luc reporter: NLSA activated transcription in response to 17β-estradiol and tamoxifen, but not in response to ICI 182,780, while ERβ 148-530 Flag only activated transcription in response to 17β-estradiol. This confirms that AP-1 is the target transcription factor of NLSA and ERβ 148-530 Flag actions. We can conclude that the stimulation of reporter activity depended on transfected ER, since cells transfected with only the reporter showed no induction of transcription in the presence of ER ligands (data not shown). The activities of ER wild-type receptors in the presence of the various ER ligands are shown in Fig. 3D. The coll-73-luc reporter was repressed 2-fold in response to 17β-estradiol, DES and estren, while transcription was induced 2.5-fold in the presence of the full estrogen antagonist ICI 182,780 upon co-transfection with ERα or ERβ into HC11 cells. As expected, only ERα repressed the reporter in response to PPT. Interestingly, however, only ERβ wild-type activated transcription in response to SERMs: the reporter was induced by a factor of 2.5 in the presence of tamoxifen, raloxifene, nafoxiden or idoxifen. In summary, ERs located in the cytoplasm show responses to SERMs on the AP-1-regulated collagenase promoter that are different from those shown when the ERs were present in the nucleus, and the two ER subtypes differ in their ligand preferences. The coll-73-luc reporter was co-transfected together with cytoplasmic ER variants into HC11 cells and the stimulation of reporter activity was analysed in the presence of inhibitors of the MAP-kinase and PI3-kinase signalling pathways in order to analyse what signal transduction pathways are required for 17β-estradiol-induced activation of AP-1. Fig. 4A shows that 17β-estradiol-induced activation of the reporter in the presence of NLSA, ERβ 148-530 Flag or C201A/C204A was completely inhibited when the cells were pretreated with the MAP-kinase kinase (MEK) 1/2 inhibitor, UO126, while the activity was not significantly affected in the presence of the PI3-kinase inhibitor, LY294002. Intact MAP-kinase activity is important for non-genomic actions of ERs at AP-1 sites. (A) HC11 cells were transiently co-transfected with 500 ng coll-73-luc reporter gene and 200 ng of NLSA, ERβ 148-530 Flag or C201A/C204A. Cells were pretreated with 10 μM UO126 or 10 μM LY294002 for one hour before the addition of 10-8 M 17β-estradiol (E2), and the reporter activity was analysed 6 hours after treatment. (B) SYF cells were transiently co-transfected with 500 ng coll-73-luc reporter gene and 200 ng of NLSA, ERβ 148-530 Flag or C201A/C204A. Cells were treated with either no hormone (NH), 10-8 M 17β-estradiol (E2) or 10-7 M tamoxifen (OHT), and the reporter activity was analysed 24 hours after treatment. Luciferase activity was normalised using β-gal as an internal control. Data are representative of at least three independent experiments performed in duplicate. Mean and ± SD are shown. The involvement of Src-kinase was analysed by transient transfection of embryonic fibroblast cells derived from Src-kinase -/- mice (SYF cells) . The coll-73-luc reporter was activated in response to 17β-estradiol in SYF cells upon co-transfection with NLSA, ERβ 148-530 Flag or C201A/C204A (Fig. 4B), demonstrating that Src-kinase is not involved in the signalling pathway that regulates 17β-estradiol-induced activation of AP-1. Furthermore, only NLSA activated transcription in the presence of tamoxifen, resembling the response observed in HC11 cells. In summary, intact MAP-kinase activity is essential for 17β-estradiol-induced activation of AP-1, while neither PI3-kinase nor Src-kinase is involved in this effect. In contrast, however, 17β-estradiol-induced activation of Stat proteins does require all three pathways to be intact . Thus, we conclude that the combinations of signal transduction pathways required for 17β-estradiol-induced transactivation of promoters regulated by AP-1 and by Stat proteins are different. We have shown in this study that the cytoplasmic localization of ERs correlates with efficient transactivation of the AP-1-regulated collagenase promoter in response to 17β-estradiol, while ERs present in the nucleus repress AP-1 activity under the same conditions. We suggest that this reversed 17β-estradiol-induced response is due to the ability of ERs to induce AP-1 activity via non-genomic signalling when they are present in the cytoplasm. It is generally believed that ER-mediated regulation of AP-1-dependent transcription results from protein-protein interactions on the promoter. ERα interacts with c-Jun in vitro [6, 9, 22] and the domain required for this interaction has been mapped to amino acids 259-302, which are located in the hinge domain of the receptor . The finding that NLSA, which lacks the entire hinge domain, efficiently activated the coll-73-luc reporter in response to 17β-estradiol (Fig. 1B) suggests that NLSA induces AP-1 activity through a distinct mechanism, independently of physical interaction with c-Jun on DNA. Furthermore, the coll-73-luc reporter was similarly induced in response to 17β-estradiol upon co-transfection with a cytoplasmic ERβ variant (ERβ 148-530 Flag) (Fig. 1B), suggesting that non-genomic signalling is involved. The finding that ERβ 148-530 Flag also activated the Stat-regulated β-casein reporter in response to 17β-estradiol (Fig. 1C), as has been previously shown for NLSA , supports our hypothesis that the deletion mutant acts via non-genomic signalling in the cytoplasm. In contrast, however, a corresponding deletion mutant comprising a Flag tag upstream of the N-terminus (ERβ Flag 148-530) was present in the nucleus, and hence was unable to activate the coll-73-luc reporter via non-genomic signalling (Fig. 1B). Our results suggest that cytoplasmic re-localization of ERs and subsequent signaling through cytoplasmic signal transduction pathways is an additional mechanism by which ERs are able to modulate the transcriptional activity of AP-1. It should be noted that there are discrepancies in the literature regarding ER action at AP-1 sites. In accordance with our results, repression of the collagenase promoter in the presence of ERα and ERβ bound to 17β-estradiol has been described [9, 23, 7]. In contrast, however, other studies have shown that ERα bound to 17β-estradiol induces activation of AP-1 [6–8]. Differences in experimental conditions could explain some of the discrepancies obtained with ERs acting in the nucleus. We recently reported that the introduction of various point mutations into the ERβ DBD results in an altered response by ER ligands on the collagenase promoter . The results presented here suggest a mechanism for this phenomenon. Disruption of the second zinc binding motif (as in the ERβ mutant C201A/C204A) resulted in altered localization of the receptor in the presence of 17β-estradiol. The coll-73-luc reporter was also efficiently activated under these conditions (Fig. 2A and 2B). Furthermore, C201A/C204A activated the β-casein reporter in response to 17β-estradiol more efficiently than the wild-type-receptor, suggesting that C201A/C204A acts via non-genomic signalling in a manner similar to that in which both NLSA and ERβ 148-530 Flag act. Notably, all of the ERβ DBD mutants described in  that reversed the response to 17β-estradiol on the collagenase promoter acted in the same manner (data not shown). Thus, we suggest that the introduction of various point mutations into the ERβ DBD enables the receptor to induce AP-1 activity via non-genomic signalling, due to re-localization of the receptor to the cytoplasm in the presence of 17β-estradiol. This phenomenon is not restricted to HC11 cells, since similar results were obtained in the human breast cancer cell line MCF-7, the human uterine cell line Ishikawa and the human hepatic cell line HepG2 (data not shown). In COS-7 cells, on the other hand, ERβ 148-530 Flag and the various ERβ DBD mutants, although present in the cytoplasm, only showed weak responses on the coll-73-luc reporter in the presence of 17β-estradiol, while NLSA efficiently activated the reporter (data not shown). These results are in accordance with our previous results  and suggest that non-genomic signalling via ERβ is not as efficient in COS-7 cells as in HC11, MCF-7, Ishikawa, HepG2 and SYF cells, while ERα is active in all cells tested. A natural splice variant of ERβ lacking the C-terminal part of the DBD (ERβδ3) localizes to discrete nuclear spots and activates transcription at AP-1 sites in the presence of 17β-estradiol . This agrees with the results presented here. Interestingly, however, we found that our ERβ DBD mutants, including one that lacked the entire DBD, not only localized to discrete nuclear spots, but also re-localized to the cytoplasm upon 17β-estradiol treatment. Furthermore, it has been suggested that a similar supernormal activity of an ERα DBD mutant (K206A) on the collagenase promoter arises from the inability of 17β-estradiol-bound K206A to recruite a putative co-repressor complex to the promoter. This inability would allow for effective target gene transcription . However, the finding that ERβ 148-530 Flag efficiently activated the coll-73-luc reporter in response to 17β-estradiol (Fig. 1B) demonstrates that the activity is not unique for receptors that have mutations within the DBD, and which would therefore be unable to interact with such a co-repressor complex through the DBD. Rather, our results suggest that ERβ 148-530 Flag and the various ERβ DBD mutants described in  induce AP-1 activity via non-genomic signalling when present in the cytoplasm. We can not, however, rule out additional mechanisms by which ERs that have mutations within the DBD may act at AP-1 sites. The ability of ER to modulate AP-1-dependent transcription in the presence of SERMs is specific for a particular subtype of ER, and this ability depends on the cellular localization of the receptor. While ERα wild-type was inactive in the presence of SERMs, ERβ wild-type activated the coll-73-luc reporter in response to tamoxifen, raloxifene, idoxifene and nafoxidene (Fig. 3D). In contrast, however, NLSA activated transcription in response to tamoxifen, while ERβ 148-530 Flag and C201A/C204A were inactive in the presence of all SERMs tested (Fig. 3A and 3B). Notably, the inability of C201A/C204A to activate the coll-73-luc reporter in response to tamoxifen is not due to persistent nuclear localization of the protein, since the receptor re-localized to the cytoplasm also in the presence of estrogen antagonists (data not shown). Thus, tamoxifen-induced activation of AP-1 via non-genomic signalling appears to be specific for ERα. These results provide new insights into the mechanisms that underlie the tissue-specific actions of SERMs observed in vivo. Non-genomic actions exerted by tamoxifen at AP-1 sites probably contribute to some of the responses, such as, for example, the responses in target tissues where pools of ERα are localized to the cytoplasm, such as the mammary gland, bone, brain and the cardiovascular system [26–31]. Several genes involved in cell proliferation are regulated by AP-1, and thus the non-genomic actions of ERs at these sites may be highly important, and they may contribute to phenomena such as tamoxifen-resistance in ER-positive breast cancer cells. 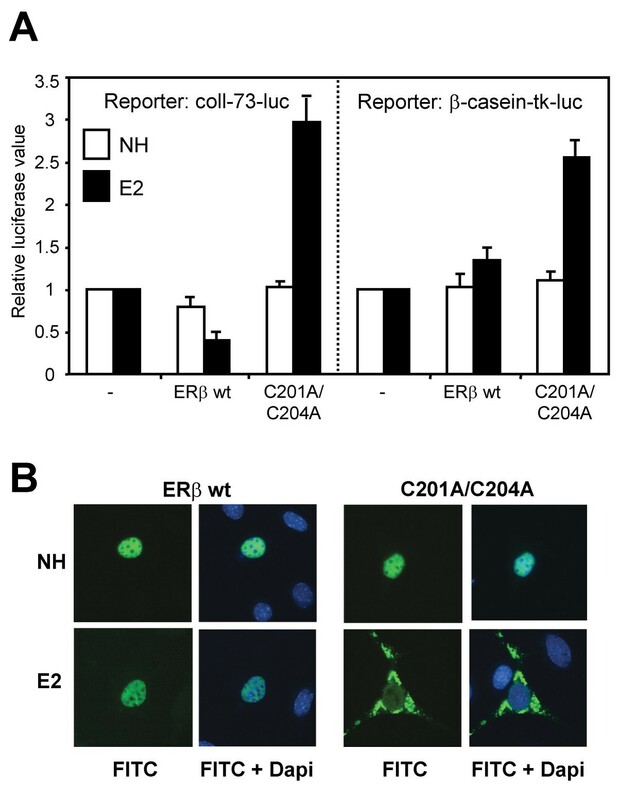 The full estrogen antagonist ICI 182,780 completely inhibited 17β-estradiol-induced activation of the coll-73-luc reporter in the presence of cytoplasmic ERs (Fig. 3A and 3B), and this finding agrees with our previous results showing that non-genomic actions of ERs are inhibited in the presence of ICI 182,780 . It has been suggested that the synthetic compound estren distinguishes between genomic and non-genomic actions of ERα . Importantly, however, we found that the coll-73-luc reporter was repressed in the presence of ER wild-type receptors and estren (Fig. 3D), and we found that estren can induce AP-1-dependent transcription via non-genomic signalling (Fig. 3A and 3B). Hence, estren affects the activity of ERs present both in the nucleus and in the cytoplasm. MAP-kinase activity induced by 17β-estradiol results in an enhanced DNA-binding activity of AP-1  and 17β-estradiol-induced expression of cyclin D1 depends both on the AP-1 site within the promoter and on an intact MAP-kinase activity . We have shown that an intact MAP-kinase pathway is required for 17β-estradiol-induced activation of the coll-73-luc reporter, and we have shown that the activity does not depend on an intact PI3-kinase activity (Fig. 4A). These results agree with those of Dos Santos and those of Marino. Furthermore, Src-kinase is not required for 17β-estradiol-induced activation of AP-1, as shown by the intact responses on the coll-73-luc reporter upon co-transfection of cells devoid of Src-kinase with NLSA, ERβ 148-530 or C201A/C204A (Fig. 4B). We have previously shown that 17β-estradiol-induced transactivation of Stat-regulated promoters requires intact MAP-kinase, PI3-kinase and Src-kinase activities . Thus, our results suggest that distinct signal transduction pathways are involved in ER-dependent non-genomic actions targeting promoters regulated by AP-1 and by Stat proteins. The transcriptional activity of c-Jun depends only on serine phosphorylation . However, tyrosine phosphorylation is a pre-requisite for inducing nuclear translocation and DNA-binding activity of Stat proteins , and this may explain why Src-kinase and PI3-kinase  are required in the pathway targeting Stat-regulated promoters. Furthermore, the inability of 17β-estradiol-bound ERs to induce Src-kinase activity in the presence of estrogen antagonists  might explain our previous finding that 17β-estradiol-induced activation of Stat proteins is inhibited in the presence of tamoxifen . In contrast, however, NLSA induced AP-1 activity in response to tamoxifen (Fig. 3A), independently of Src-kinase activity (Fig. 4C). Thus, the set of signal transduction proteins available in a given cell probably determines which target transcription factors are activated by ligand-bound ERs present in the cytoplasm, and hence the cellular outcome. Our results show that ER modulates AP-1-dependent transcription through two distinct mechanisms: via protein-protein interactions on DNA; and via non-genomic actions. The mechanism used depends on the cellular localization of the receptor. In addition to the more extensively studied cross-talk on DNA, additional non-genomic actions might be very important in target tissues in which membrane-associated ERs are found. These non-genomic actions probably contribute to the overall physiological responses mediated by ligand-bound ERs. The coll-73-luc reporter was provided by Peter Kushner (University of California, San Francisco, USA) , the β-casein (-344 to -1) luciferase reporter was provided by Bernd Groner (Frankfurt, Germany)  and the TRE-tk-luc reporter by Sam Okret (Karolinska Institutet, Huddinge, Sweden). The following plasmids have been described previously: mouse ERα expression vector pMT2-MOR , pMT2-MOR Δ245-307 (NLSA)  and human ERβ expression vector pSG5-ERβ . The pSG5-ERβ DBD mutant (C201A/C204A) and the N-terminal deletion mutants (ERβ Flag 148-530 and ERβ 148-530 Flag) were constructed by recombinant PCR and verified by automated sequencing. 17β-estradiol, 4-hydroxy tamoxifen, nafoxiden, diethylstilbestrol and genistein were purchased from Sigma. The full estrogen antagonist ICI 182,780 and the ERα selective agonist PPT were purchased from Tocris Cookson Inc., MO, USA. 4-estren-3α,17β-diol was purchased from Steraloids, RI, USA. The MEK1/2 inhibitor, UO126, and the PI3-kinase inhibitor, LY294002, were purchased from Cell Signalling Technology, MA, USA. Raloxifene and idoxifene were obtained from Karo Bio AB. HC11 cells were cultured in RPMI 1640 medium (Life Technologies, Inc., Buckinghamshire, UK) supplemented with 10% FBS, 5 μg/ml epidermal growth factor (human recombinant; Sigma) and insulin (Actrapid; Novonordisk, Denmark). SYF cells (purchased from ATCC™) were cultured in Dulbecco's modified Eagle's medium (DMEM) (Life Technologies, Inc.) supplemented with 10% fetal bovine serum (FBS) (Life Technologies, Inc.). For transient transfection assays, cells were seeded in DMEM free of phenol-red (Life Technologies, Inc.) supplemented with 5% dextran-charcoal-stripped (DCS) FBS (HyClone Laboratories, Inc., UT, USA) in 24-well microtitre plates 24 hours before transfection. Cells were transfected with reporter plasmid, pCMV-βGal plasmid as an internal control and various expression plasmids, as indicated in the figure legends, using lipofectamine (Life Technologies, Inc.). Incubation with lipofectamine-DNA complexes was carried out for 5 hours in serum-free medium. Fresh medium was added after the transfection and the cells were incubated with hormones, as indicated in the figures, for 16 hours. The cells were harvested in lysis buffer (10 mM Tris-HCl pH 8.0, 1 mM EDTA, 150 mM NaCl and 0.65% NP-40) and extracts were assayed for luciferase and β-galactosidase activity in a microplate reader (Lucy-1; Anthos, Salzburg, Austria). For immunofluorescence studies, HC11 cells were seeded onto coverslips placed in 6-well tissue culture plates in phenol-red free DMEM supplemented with 5% DCS FBS. Cells were transfected with lipofectamine as described above and then processed for histological studies, as previously described . ERα proteins were detected using the polyclonal antibody H-184 (Santa Cruz Biotechnology, Inc., Santa Cruz, CA). ERβ proteins were detected using an ERβ polyclonal antibody (Upstate Biotechnology, Inc., Lake Placid, NY) and a monoclonal Flag antibody (Santa Cruz Biotechnology, Inc.). An appropriate fluorescein isothiocyanate (FITC)-conjugated secondary antibody (DAKO A/S, Glostrop, Denmark) was used. Cell nuclei were stained with 4,6-diamidino2-phenylindole (DAPI). We thank Peter Kushner and Sam Okret for kindly providing reagents. This work was supported by the Swedish Cancer Society, the Karolinska Institutet, the Swedish Medical Society and the M Bergwall Foundation. L.B. carried out all the experiments and prepared the manuscript. M.S. conceived and directed the study. Both authors read and approved the final manuscript.